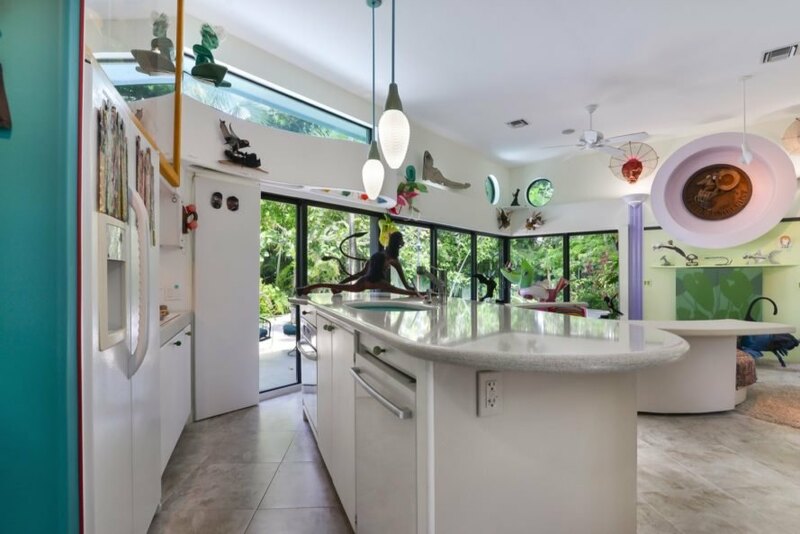 A truly one-of-a-kind home has surfaced on the Florida market that offers luxury living in a lush, jungle-like environment as well as a wealth of upcycled art. 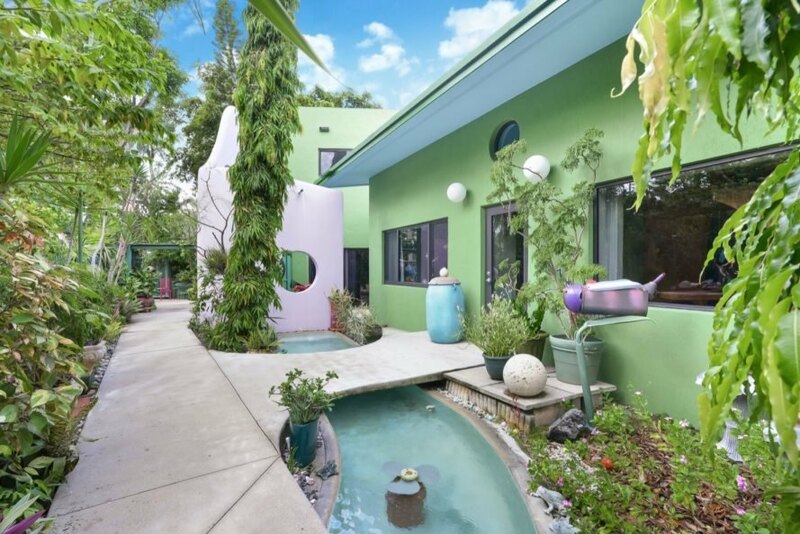 Located just north of Fort Lauderdale in the town of Wilton Manors, the home is a sculptural oasis designed by owner Michael Jude Russo, an internationally renowned multimedia artist. 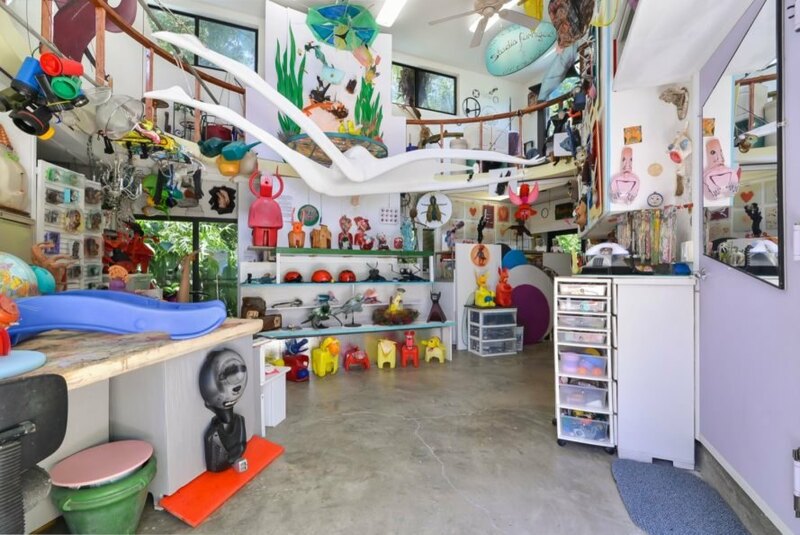 Filled with light and views of the outdoors, the unique two-bedroom, two-bath dwelling is now being sold for $1,200,000, an asking price that includes all of the sculptures and art on display in the house, studio and gardens. In addition to the property’s many artworks that were built of recycled and reclaimed materials, the home and furnishings were constructed primarily from sustainable and natural building materials. Russo also added that all the landscaping and house upkeep were “organically maintained,” meaning no pesticides were used. The plumbing, electrical systems and roof were replaced in 2009. Original artist-designed light fixtures and built-in, sculptural, artist-designed glassware and china cabinets can be found throughout the home. Water features prominently in the landscape, from the 10,000-gallon saltwater swimming pool to the 1,500-gallon river water feature integrated with two fountains and a salt system. Full-height sliding doors create a seamless connection with the garden. 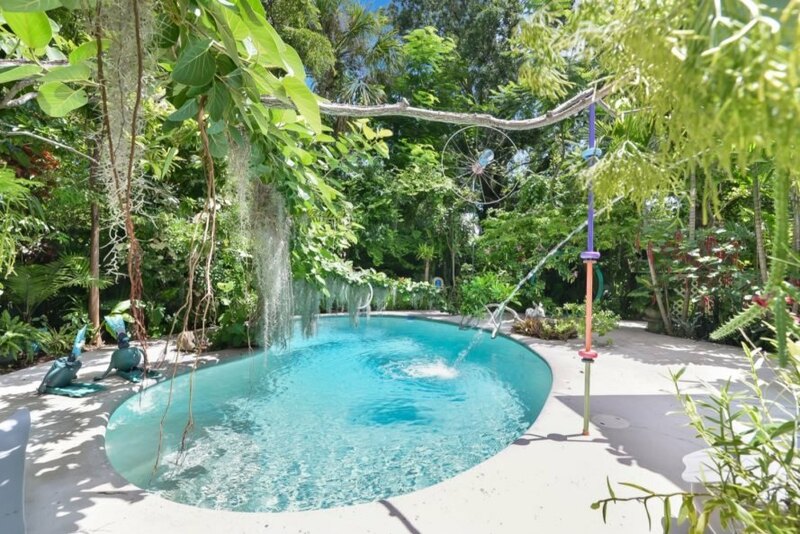 The property at 401 NE 26 Drive, Wilton Manors, Florida is currently being listed by Virginia Hornaday of ONE Sotheby’s International Realty for $1,200,000. 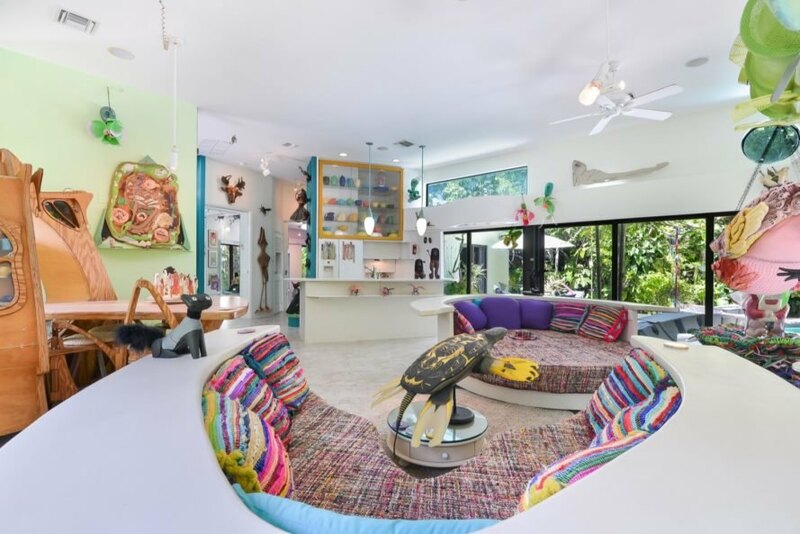 This home outside of Fort Lauderdale is filled with the acclaimed art of Michael Jude Russo. Russo is an internationally known artist who is known for his upcycled, multimedia works. The residence is filled with Russo's art, which is included in the price. The house is available for $1.2 million. White walls and glass windows balance the funky art throughout. The glass walls also connect the home to its surroundings. The house features a bold, unique personality. 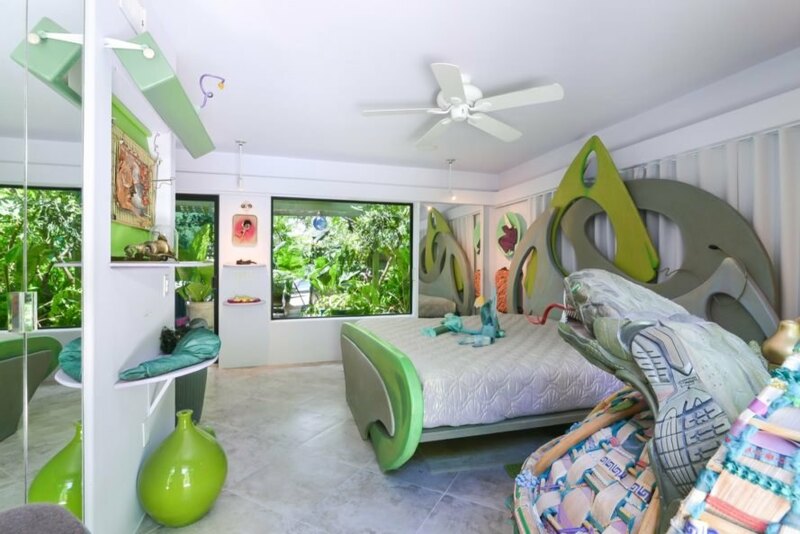 Green accents in the bedroom complement the greenery outside. Even the bathroom is adorned in art. Outside, relaxed patios and lush gardens welcome you to rest. The landscape has several water features, including a small river. The outdoors are decked out in sculptures and art. A saltwater swimming pool is ideal for hot summer days.